According to the US Energy Information Administration, in 2009, total oil production for the Philippines was 24.57 thousand barrels per day; crude oil production was 24.40 thousand barrels per day; and consumption was 313 thousand barrels per day. Proven reserves of oil were 0.14 billion barrels. In 2009, production of natural gas was 111 billion cubic feet; consumption was also 111 billion cubic feet, and proved reserves were 3 trillion cubic feet. Since 1998, the Philippines downstream oil industry has been deregulated. It is currently dominated by two major oil refining and marketing companies; Petron and Pilipinas Shell. A third oil refiner and marketer, Caltex Philippines Inc, converted its 86 500 bbl/d refinery into an import terminal in 2003; it now operates as a marketing and distributing company under the name Chevron but maintains its Caltex brand. State-owned Philippine National Oil Company (PNOC) and Saudi Aramco jointly own Petron; each with 40 % stake while public holds the remaining 20% share. Petron operates a 180 000 bbl/d refinery and over 1 200 gasoline stations nationwide. Pilipinas Shell operates a 110 000 bbl/d refinery and more than 800 gasoline stations; and Caltex/Chevron has two import terminals and more than 850 retail gas stations in the country. PNOC Exploration Corporation, the upstream subsidiary of PNOC, is the undisputed leader in the energy industry, and is involved in oil and gas exploration and production, natural gas trading, coal exploration and production, coal marketing and trading as well as port and warehousing. 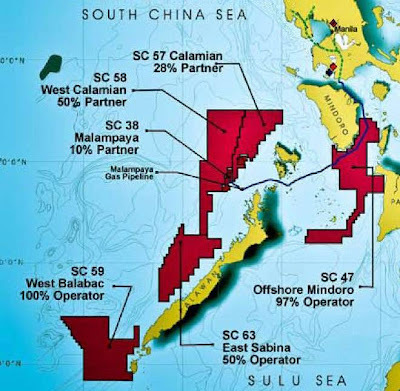 Another major player is Nido Petroleum whose business activities are focused on the offshore Palawan Basin. The company is headquartered in Perth, Western Australia and is listed on the Australian Stock Exchange. Located in the South China Sea, 80 kilometres northwest of Palawan, Malampaya Deep Water Gas to Power Project involves extracting gas from a reservoir located 3 000 metres below sea level. The gas flows through five sub-sea wellheads to a manifold in 820 metre water depth, through two 30 kilometre flowlines to a shallow water production platform where the gas is dried. The dried gas is then transported through a 504 kilometers sub-sea pipeline from the platform in offshore Palawan to the onshore gas plant in Batangas where gas is further processed with the removal of hydrogen sulfide and finally delivered to three combined-cycle gas turbine power plants. This natural gas is used as fuel for three power plants in Batangas, which provides up to 2 700 MW of electricity, representing 25% of the installed capacity of the Luzon grid. Gas production from January to May 2006 reaches 42.3 billion cubic feet while condensate production totaled 2.1 million barrels. Among other plans, the government aim to expand the coverage of the proposed $1.2 Billion Batangas-Manila natural gas pipeline to include delivery of the fuel to industrial and household users. Through the pipeline was initially designed to deliver natural gas from Tabangao, Batangas, to the fuel-fired power plant in Sucat, there are now plans to extend it to Quirino Highway in Novaliches, Quezon City. Another ambitious plan on the drawing board is to build LNG infrastructure not only in Luzon but all over the country. Once natural gas from the Malampaya field run outs, LNG will be used to fuel the 1200 MW Ilijan power plant of Korea Electric Power Corp. and the 1000 MW Sta. Rita and 500 MW San Lorenzo plants of the Lopez-led First Gen Corp.